It’s been a few days since my last blog and a lot has happened since Friday. The living room, which right now looks like a war zone of cables because we just had our internet installed. 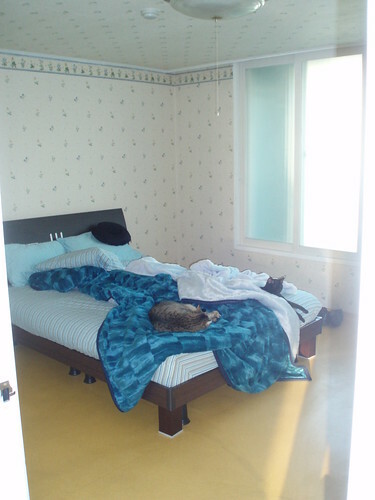 One of the bedrooms which we now use for the cat’s stuff. 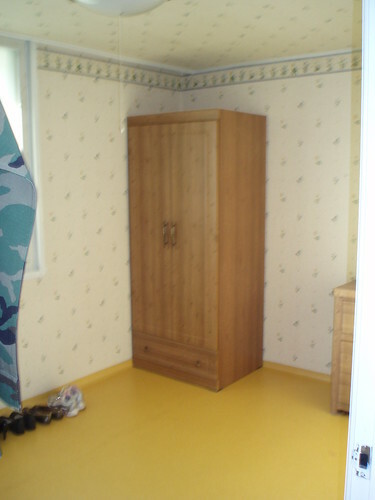 Another bedroom, which we currently use for storage. 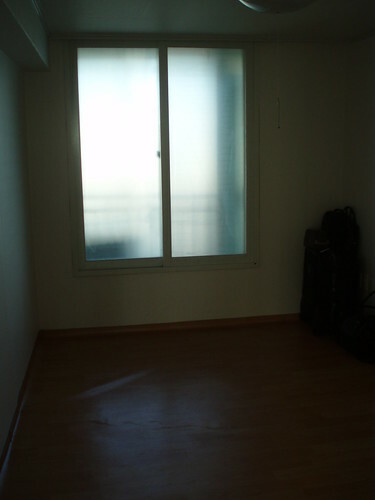 Joe has ideas to make this room into a poker room as soon as he can find some players around Osan. A little blurry but we use this bedroom as a massive closet. I have almost filled the room and our boxes from the states haven’t even arrived so I may need a few more closets. 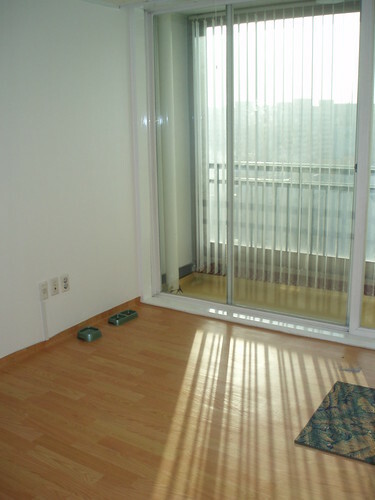 In Korea, the bedrooms don’t have built-in closets so you have to get large wardrobes. We negotiated with our landlord for a wardrobe and dresser because the apt. didn’t come with much furniture. 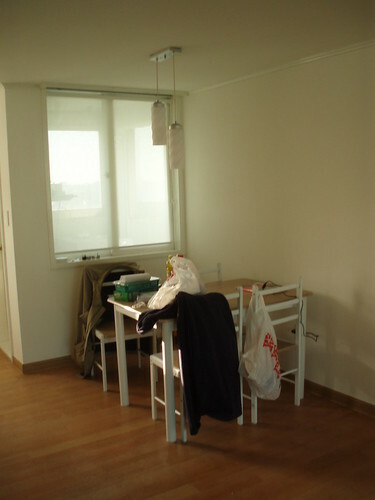 We also got her to throw in a waher/dryer which in Korea is all one machine – weird huh? Our bedroom… Notice we have already invested in 2 mink blankets because it is freezing here. Koreans keep their homes and shops very cold, the electricity here is not cheap, so they sell mink blankets on the streets near the base. They are not actual mink but they are very soft and heavy. As you can see, Loosey & Meo have settled in here very well. I am making the best of our tiny kitchen. 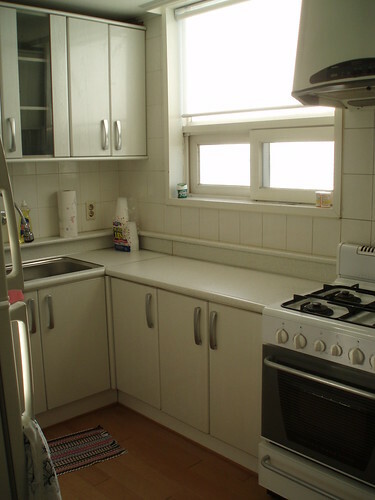 It reminds me of the one I had in NYC, even the fridge is smaller than normal. Our dining area is pretty bare too. 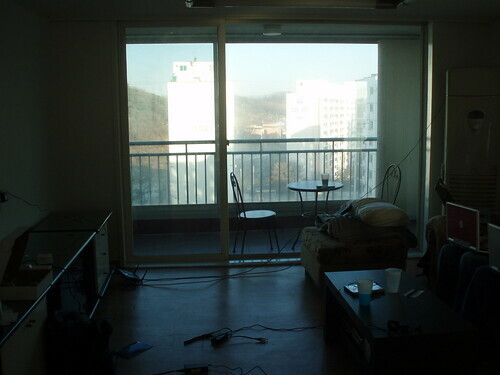 The furnished apts. here are pretty sparse and the landlord doesn’t want us to hammer nails into the wall so I’m doing what I can to spruce up the apt. 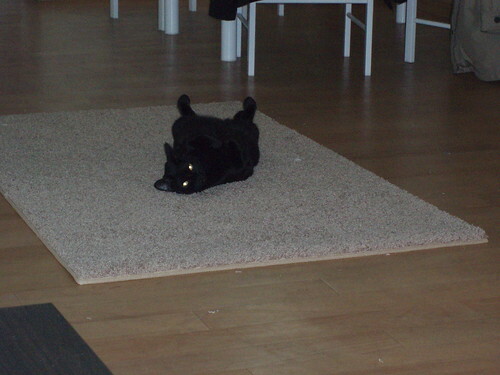 Meo making herself at home. It didn’t take long for Loosey and Meo to get acclimated to their new surroundings. I think they were just happy to not be living in a basement or kennel. 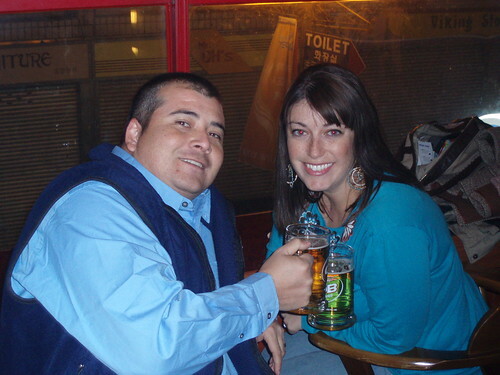 Friday night: Our friend Jason, who is stationed at Camp Long in Wonju, came up for the long weekend. We went out for a drink and some Thai food and relaxed at home after a long day. 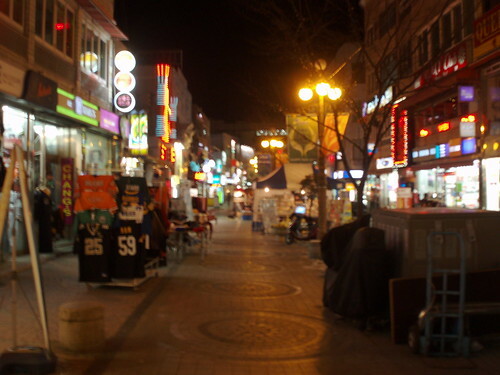 This is a picture of the Shinjang-dong shopping district I mentioned in my previous posts. The street is lined with restaurants, bars, cell phone stores and clothing stores. In Korea you can buy really good fake purses (they specialize in Coach and Dooney & Bourke), fake sports jerseys and tailor made suits. You walk into any suit store, they take your measurements, you pick out a fabric and within a few days you have a tailor made suit. I can’t wait until my first paycheck. 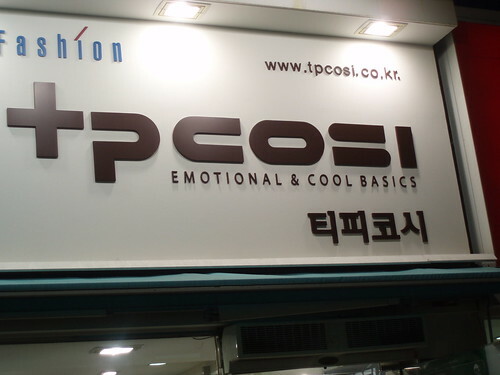 Some more pics of funny signs: TP Cosi, home of the emotional and cool basics. J. Cosi (I think this is a knock-off of J. Crew) is the sensitive basic icon. 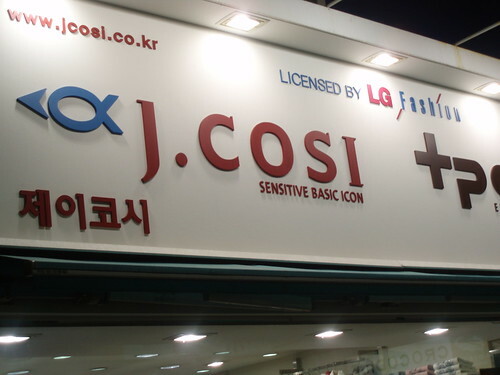 I’m guessing this is the Korean version of Victori’s Secret. Too funny! Since we have no groceries yet we decided to go to the local bakery and 7-11 for some breakfast foods. What we came back with was pretty sad. From the bakery (which is called Tous les Jours) we got a green tea danish (which was gross), some coffee and some french bread croutons. 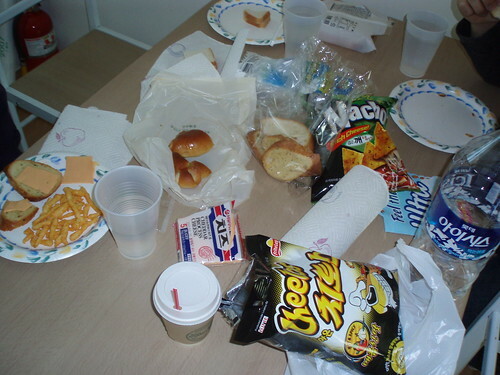 From the 7-11 we got some Korean Cheetos and Doritos, and Joe got some cheese singles for his croutons. As you can imagine, we were starving for a real lunch only a few hours later. Saturday afternoon: We walked around Songtan for a while, finally got me a cell phone and had a good lunch at Blue Opera. 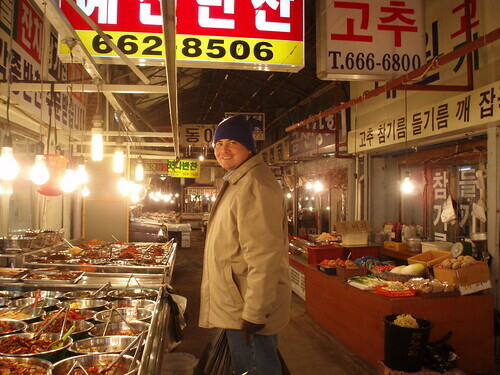 We then took Jason to what Joe and I refer to as the Kimchi-Mart, which is an enclosed alley of Korean food vendors selling everything from fresh seafood to items you can’t even recognize. This is Joe standing in front of what has to be 40 different kinds of homemade kimchi. We picked up a few kinds of kimchi along with some Jabchae for the equivalent of about 9 US dollars. Saturday night: After running around all afternoon we went home to relax for a while. Around 6 PM we took a cab back to base and Joe and Jason went to play poker at the Officer’s Club (Jason got 13th and Joe got 7th out of 60) while I went back to the BX for more items for the apt. By the time the boys were done and I had put everything away I was too tired to meet them out at a bar. Military personnel have a 1 AM curfew here at Osan so people go out pretty early here. Sunday: We got up late this morning and went back dowtown. 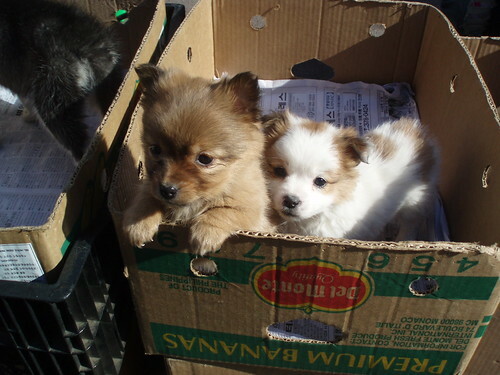 As soon as we stepped out of the cab we saw this old Korean man selling the cutest puppies (Mom, those are Pomeranian puppies) I wanted the brown one because he reminded me of my old Pom, Skippy but Joe wounldn’t let me get him. They were only $60 USD but it’s hard to travel in the military with more than 2 animals. 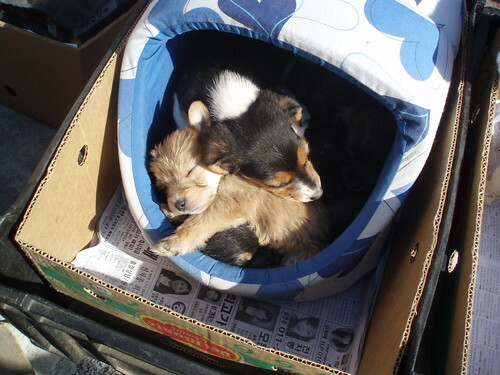 Here are some more pups the man had. You can’t really tell but there were probably 6 or 7 puppies cuddled up in that dog bed. They were so small and cute, I’m sure they were too young to have been taken from their mothers. I wanted to cry when Joe finally tore me away from those little guys. After we ran some more errands around base we ate some dinner at Chili’s on base and headed home. We’re just hanging out, watching movies on our computers. I (Donna) always checked for updates on your site. It’s like a soap opera and i am one of the avid followers of yours. The pups are cute and cuddly. Meo and Loosey looks so comfortable :-)they really love the blanket. Well, you guys take care always and we can’t wait to see you next year!!! I too have read your blogs…you are an amazing writer and you inspire me to want to just pick up and leave everything behind. Your life seems like such an adventure. Kudos to you!